From Boulia, take the Diamantina-Bedourie Loop. A Four Wheel Drive vehicle with high clearance is necessary for travel to the Diamantina National Park as many roads are unsealed and wheel ruts can be deep. Get up close and personal with unique wildlife, follow one of the self-guided scenic drives and learn about the park's fascinating history. In Bedourie, say hello to the locals at the historic Bedourie Hotel, a building largely untouched since the late 1800's. As you travel north to Boulia, take in the changing landscapes from desert sands to the treeless Mitchell Grass country. Keep an eye out for amazing birdlife along the way such as flocks of Budgerigars, Corellas and Galahs. About half way between Bedourie and Boulia is the Vaughan Johnson Lookout on the Marion Downs property. Make sure you take your camera for capturing the stunning views. There are toilet and picnic shelter facilities at the lookout as well as some interpretation panels providing good information on early pastoralism and transportation. The Diamantina-Bedourie loop drive will conclude on your return to Boulia. If you're planning on spending a few days in Boulia, grab a meal at the Australia Hotel the local watering hole or play a round of golf at Boulia's 18-hole sand green course. Plan your visit for Easter and enjoy the Boulia Rodeo, Races and Campdraft or in July and experience the iconic Boulia Camel Races, the second richest professional camel races in Australia. There's even drag racing in August. Oh....and keep one eye peeled for the elusive Min Min Light. In Boulia, visit the Min Min Encounter for a unique theatrical experience - a 45 minute tribute show to the long honoured art of the bush yarn, based around the famed Min Min Light phenomenon. Call into the well-preserved historical Stonehouse Museum, one of the first homes built in Western Queensland, which also houses the Marine Reptile Fossil exhibit, evidence of Boulia once being part of an Inland Sea over 100 million years ago. See the last recognised Corroboree tree of the Pitta Pitta tribe - a rare and ancient Waddi Tree. Approximately 25 kilometres out of town is the Old Police Barracks (1875-1884). There is a covered picnic table beside the waterhole, an ideal spot for fishing, bird watching and taking in the tranquility of this bush setting which had great spiritual significance to the local people. The famous Boulia Camel Races are held every third weekend in July attracting people from all over the world. Boulia accommodation includes a hotel/motel, motel, caravan park and bush camping. Rex Air operates twice-weekly flights into Boulia from Brisbane. Nearest hire car facility is Mount Isa Airport (approximately three hours drive). Contact the Min Min Encounter Information Centre for more information. Ensure that you have plenty of fuel and water before taking the Springvale Road east to Diamantina National Park. The Worldwide Fund for Nature has named Diamantina National Park one of Australia's top 10 National Parks. The park's large permanent waterholes attract many animals and are particularly good for bird watching at dawn and dusk - exploring in your own canoe is worthwhile. There are many rare and threatened species in this 507,000 hectare park including the kowari, plains wanderer, freckled duck, peregrine falcon and two rare skinks. The weathered sandstone ranges, dune fields and flood plains are a photographer's delight and the view of Hunter's Gorge from Janet's Leap is spectacular. Follow the self-guided Warracoota Circuit (approximately 90 kilometres from start to finish) to explore pastoral relics and learn about the desert landscape and its importance to the Maiawali and Karuwali Aboriginal people. Open all year however wet weather may cause temporary closures. Visiting is recommended from April to September. Pick up a park information guide from the visitor information room or self-registration stand at one of the camping areas. Camping is available at Hunters Gorge and Gum Hole camping areas. More information is at the National Parks website. Proceed south on the Diamantina River Road before heading west on the Monkira Davenport Road to Bedourie. 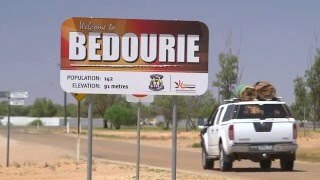 Located on a sand dune surrounded by Eyre Creek, Bedourie is one of two towns, the other being the iconic Birdsville, in the second largest shire in Queensland, the Diamantina Shire which is twice the size of Denmark. Its most notable landmark is the Bedourie Hotel, previously known as the "Royal." Constructed from sun-dried mud bricks and originally with a thatched roof, the building has been largely untouched since the late 1800's. Meals and accommodation are available there and also at the Simpson Desert Oasis Roadhouse. Also in Bedourie, see The Dust Storm Sculpture representing the Spinifex in a dust storm and visit the Mud Hut, Bedourie's most historical building dating back to the 1880's. At the Artesian Spa and Aquatic Centre, you can ease your tired muscles in the 22-person therapeutic spa and cool off in the 25 metre swimming pool. The crystal-clear water comes directly from Bedourie's artesian bore.